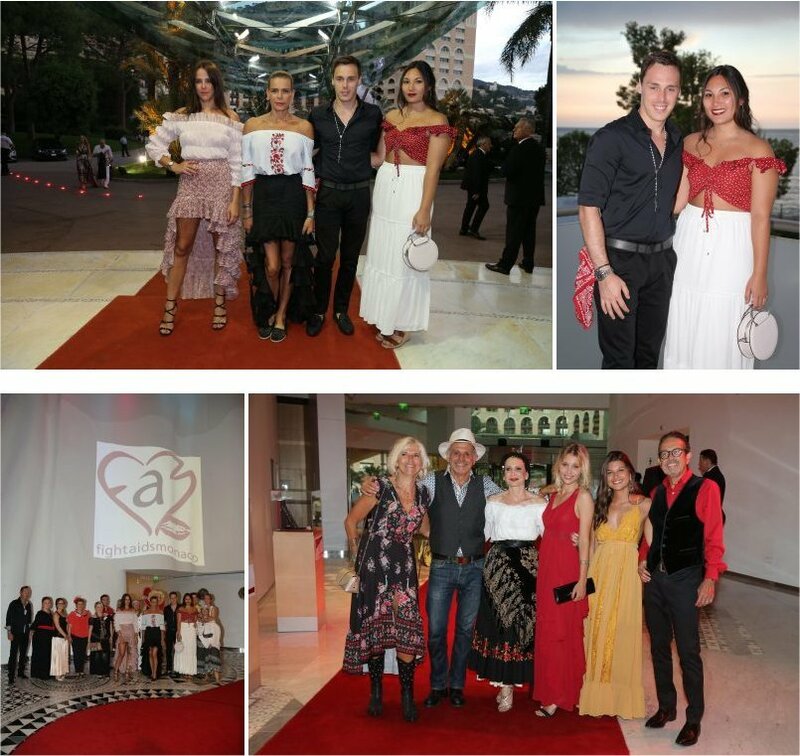 Princess Stephanie of Monaco looked joyful and in great spirits on arrival at the Sporting Monte-Carlo on Saturday July 7, 2018, accompanied by her children, Camille, Pauline, Lois and his fiancée, all in their theme-required gypsy attire, for the annual Fight Aids Monaco fundraising Gala. The show this year was assured by The Original Gypsies, four of the historic members of the Gypsy Kings who reunited after more than twenty years, and delighted the privileged guests at the rhythm of their guitars performing their hits Bamboleo, Volare, Djobi Djoba, A Mi Manera and more. The event was perfectly animated by well-known radio and TV presenter Marc Toesca who also conducted the fundraising raffle. The association’s mascot Manel Dalgo, adorable female impersonator dancer delighted the public with his performance and magnificent costumes. Manel, who has a big heart, has been a loyal and highly dedicated volunteer for the association for many years. Through donations and the proceeds of a grand raffle of items offered by generous donors such as Cartier, Yves Piaget and others, FAM raised Euro 40,000 that will enable the 130 affiliated members to benefit from cultural, ludic and sportive trips all along the year, a needed breath of fresh air in their daily lives that provides wellness and comfort, as well as receiving psychological assistance. The funds also help run the Maison de Viein Carpentras created in 2010, offering those in need a pause of a couple of weeks, the time to recover and gain forces in an ambiance of goodwill and friendliness, while helping them reintegrate into society. On Saturday, July 7, 2018, the Mayor of Monaco, surrounded by several members of the town Council, welcomed HSH Princess Stephanie, Didier Gamerdinger, Michel Sidibe, Executive Director of UNAIDS, Bertand Audoin, Vice-President IAPAC, in charge of the program “The villages committed fro Europe”, in the framework of the Signing of the Paris Declaration “Towards Monaco without AIDS”. The plan I to increase the “Test in The City” campaigns to twice a year and launch, during the 4thtrimester of 2018, a communication campaign around U=U “Undetectable = Untransmittable”. 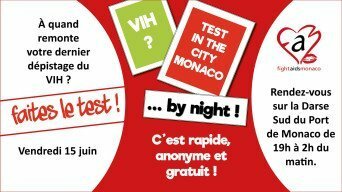 On Friday, June 15, 2018, in the presence of HSH Princess Stephanie, Fight Aids Monaco organized their annual HIV preventive screening operation Test in the City, a chance to take the VIH test with the Rapid HIV Testing (TROD or Test Depistage rapide a Orientation Diagnostique in French) that provides immediate results. To be accessible to young people during the summer period, the operation took place for the first time between the hours of 19:00 and 02:00 on the Southern Dock of the Port of Monaco, between the Rainier III Pool and the Brasserie of Monaco. The Emergency Services of the Princess Grace Hospital was associated to this action. It is an anonymous screening test, free of charge and fast, with results within 10 minutes, that enables to detect anti-HIV-1 and anti-HIV-2 antibodies by a simple prick in the finger, easily carried out by non-medical people who are nevertheless trained in this procedure. Although HIV testing capacity has increased over time, enabling more people to learn their HIV status, the majority of people with HIV are still unaware they are infected. The important value added objective of this screening is to keep people informed about the latest scientific advances, learn how to protect oneself and others, and most importantly put an end to the stigma of discrimination.